Livingston Manor Free Library is having a 3D Printer class for ages 10 and up on Thursday, April 18 at 3pm. Class is free, however a $5 donation suggested. Call (845) 439-5440 to register. National Library Week is April 8 – 13. We will have our Book Club meet on Wednesday, April 10 at 9:30am, and a Bookmark Craft for all ages on Thursday, April 11 at 3:00pm. National Library Week is a time to celebrate libraries and library staff and all we do for the community. Come out and join us! Livingston Manor Free Library is having an April Fools Day Craft on Monday, April 1st at 3pm. Bring your creativity, and will provide the supplies. Call (845) 439-5440 to signup. Livingston Manor Free Library is have a speaker give a presentation on the Basics of Recycling on Friday, March 22 at 1pm. Please call (845) 439-5440 to register. Space is limited. Livingston Manor Free Library is looking for a Student Aide to join our team. We are looking for a responsible, knowledgeable high school student with strong computer and customer service skills. Previous work or volunteer experience preferred. Hours would be after school and Saturdays as needed, with the possibility of summer employment. If you or someone you know is interested, please come into the library to fill out an application. Livingston Manor Free Library is closing at 3:30pm on Wednesday, February 20th. We apologize for any inconvenience. We hope to see you tomorrow. Stay safe and warm everyone! LMFL closed Tuesday,February 12 due to winter weather. The Livingston Manor Free Library will be closed on Monday, 2/18/19 for President’s Day. We will resume our normal hours on Tuesday, 2/19/19. Mondays in February at 3:30pm, Livingston Manor Free Library will be having Movie Mondays. We will be showing films for families and young adults (G or PG rated movies). Light refreshments will be served. Call (845) 439-5440 for more information. Showings will be February 4, February 11 and February 25. Livingston Manor Free Library is having a Saturday Storytime for kids aged 3 and up. We will meet on January 5 and January 19th at 10:30am. Please call (845) 439-5440 for more information and to sign up. Livingston Manor Free Library generously received a grant from The Lazare and Charlotte Kaplan Foundation at The Community Foundation of Orange and Sullivan County to have two brand new Apple Computers! Come on in and see what they can do! Don’t be scared of them – our knowledgeable staff is more than happy to help you if you have any questions. Livingston Manor Free Library is having a kids’ Craft Night on Wednesday, February 13 at 3pm, just in time for Valentine’s Day. We will provided supplies, just bring your creativity! Please call (845) 439-5440 to signup. Livingston Manor Free Library will be CLOSED Monday, January 21st in observance of Martin Luther King Day. We will return to regular hours January 22nd. Enjoy the long weekend! Livingston Manor Free Library will be CLOSED on Tuesday, January 1st in observance of New Year’s Day. Have a happy and healthy new year! We will return to regular hours Wednesday. Livingston Manor Free Library will be CLOSED Monday, December 24 for Christmas Eve and Tuesday, December 25 for Christmas Day. We hope everyone has a happy and healthy holiday season! We will return to regular hours Wednesday, December 26th. We will also be closed January 1st for New Year’s Day. Livingston manor Free Library is holding the Fourth Annual Turkey Trot 5k race on Saturday, November 17. The race will start in downtown Livingston Manor at 10am. Registration forms can be found here or can be picked up at the library itself. 5k map can be viewed here or at the desk within the library. Did you know Livingston Manor Free Library has a book club? We meet on the second Wednesday of the month at 9:30am at the library. Call (845) 439-5440 for book titles and other information. Livingston Manor Free Library is having a program providing an overview of the Legal Services of the Hudson Valley on Monday, October 15 at 7pm. The talk will focus on tenants’ rights as well as eligibility for their free legal services. Please call (845) 439-5440 to register. If you cannot afford a lawyer this program may be for you. The Livingston Manor Free Library will be closed on Monday, Oct. 8th for Columbus Day. Livingston Manor Free Library will be CLOSED on Monday, September 3rd in observance of Labor Day. Come out to the Labor Day Festival Saturday and Sunday! We will return to regular hours Tuesday. Presentation by Sullivan County Historian John Conway – Saturday, Sept. 1 at 2:00 p.m. Storyteller Karen Pillsworth will be offering a family-oriented storytelling performance at the Livingston Manor Free Library – on Monday, August 13 at 6pm. All are invited to attend! Please call (845) 439-5440 to signup. Livingston Manor Free Library is having a Summer Reading Program, Thursdays in July. Kids going into 2nd or 3rd grade have a session at 8:45 – 9:30, and kids going into Kindergarten or 1st grade meet 9:45 – 10:30. If you wold like to join please sign up in the library or call (845) 439-5440. The Monday Afternoon Book Club welcomes children in grades 4, 5 and 6. Have fun listening to stories, share reading, and craft, draw and paint fantastic projects related to the stories! 3:00-4:00 on Mondays when school is in session. Refreshments provided. All are welcome and there is no charge for participation. For more information or to register, call the library at 439-5440. Congratulations to all of the teams who competed in the 2015 Sullivan County Battle of the Books on Saturday and a special congratulations to the Livingston Manor Library team who worked so well together and earned first place! We are looking forward to the RCLS Battle of the Books in September! If you or anyone you know has a copy that would like to be donated, call (845) 439-5440. Livingston Manor Free Library’s annual budget vote is Tuesday, June 26 from 12pm-8pm. Come out and let your voice be heard! Support your local Public Library! You must be a registered voter to participate. Livingston Manor Free Library is having its annual Services Auction, being held at the Catskill Art Society on Saturday, June 9. 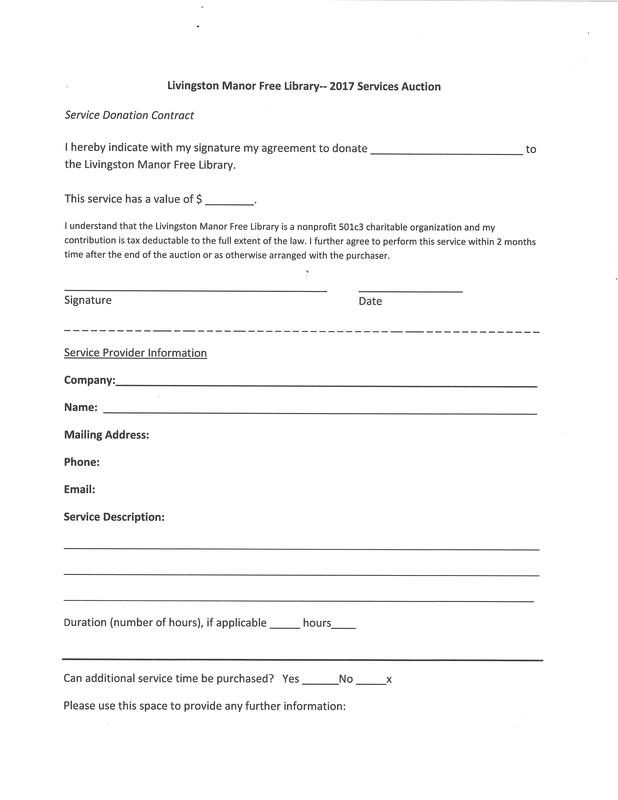 If you would like to donate a service, please click the attached image and fill out the form, or come into the library to fill one out! If you have any questions feel free to contact the library at (845) 439-5440. Livingston Manor Free Library will be CLOSED Monday, May 28 in observance of Memorial Day. Thank you all who served! We will return to regular hours Tuesday. April 9 – April 14th is National Library Week. Come out and support your local library! We are starting a book club and have our first meeting on Wednesday, April 11. There will also be an “unlucky” craft on Friday, the 13th of April. Don’t forget our ongoing weekly story hour, and free GED classes! Any interest or questions call (845) 439-5440. Livingston Manor Free Library is having AARP volunteers to assist you with taxes for free! To sign up, please call the library at (845) 439-5440. Tax help is by appointment ONLY. Livingston Manor Free Library is closed today due to the weather. Stay warm and safe everyone! Livingston Manor Free Library is closed today due to snow. Stay safe and warm everyone! Due to inclement weather, Livingston Manor Free Library is closing at 1pm on February 22. Come down and grab a book to read on this wintry day! Livingston Manor Free Library will be CLOSED Monday, February 19 in observance of Presidents’ Day. Enjoy the long weekend! Livingston Manor Free Library will be closed on Wednesday, February 7th due to weather. Stay safe and warm everyone! Livingston Manor Free Library will be CLOSED Monday, January 15th in observance of Martin Luther King Jr. Day. Livingston Manor Free Library will be closed Thursday January 4th due to weather. We apologize for any inconvenience. Curl up with a good book! Stay warm! Livingston Manor Free Library will be CLOSED January 1st in observance of New Years Day. Have a happy and healthy! We will return to regular hours Tuesday, January 2. Livingston Manor Free Library will be CLOSED December 25 and December 26 for Christmas. We will also close at 1pm Saturday, December 23rd. Happy Holidays! We will return to regular hours Wednesday. Livingston Manor Free Library will be closed 12/22 due to inclimate weather. Stay safe! Curl up with a good book! Livingston Manor Free Library will be closed today. Stay safe! Curl up with a good book! Livingston Manor Free Library is having a holiday party, December 8 from 6pm-7:30. This is being tied in with the monthly LEGO Night, and will also have kids’ crafts, a book sale and a special pajama storytime. Livingston Manor Free Library is offering a quilt raffle. A wall hanging covered bridge quilt is available, as well as a cozy quilt and a dinner runner. Call (845) 439-5440 for more information. Tickets are available at the front desk. Livingston Manor Free Library will be CLOSED Thursday November 23rd for Thanksgiving. We will also be closed Friday the 24th. We are closing early, 3pm Wednesday, November 22nd. We apologize for any inconvenience. We will return to regular hours Saturday, November 25th. Livingston Manor Free Library will be CLOSED Saturday, November 11th in observance of Veterans Day. We are open regular hours Friday and Monday. Friday, November 10 is Lego Night at Livingston Manor Free Library! Legos will be provided free of charge. Just bring your imagination and hands to build. Livingston Manor Free Library is hosting its second annual Turkey Trot! The date is Sunday, November 5th at 1:00pm. Registration is at the green space on Main Street. Enjoy running through the covered bridge! Registration forms are available here or at the library. A map of the route is here. Any questions, call (845) 439-5440. Thank you for supporting the library, and thank you to all of our sponsors! Livingston Manor Free Library and the Kaatskeller invite you to a community Halloween Party, Saturday October 28th from 12pm – 3pm. There will be pizza, scary stories, costume contest, games and more! For students in grades K-6th. Parents and siblings welcome. Call (845) 439-5440 for more information. Livingston Manor Free Library is hosting a Lego Night on Friday, October 13th at 6pm. Lego blocks are provided free of charge. Just bring your imagination and hands to build. LMFL welcomes springs with an Air Plant Fundraiser. Air plants will also be available at Flower Day, but make sure you get them while you can! Please see library for details. Livingston Manor Free Library is hosting a Lego Night AND a Game Night on Friday, September 8th at 6pm. Legos and games will be provided free of charge. Livingston Manor Free Library will be closed Labor Day Monday, September 4th in observance of Labor Day. Enjoy the long weekend at our community party! Come out to the annual Labor Day Library Festival, Sunday September 3 at 11am! Festivities start the day before, Saturday September 2nd at noon, right next door in the Eastern Star Building with an early book sale. Check out the community tables, music, stories, book sale and more! Summer reading events for children of all ages are coming up at the Livingston Manor Free Library. Children going into K-3 will have stories and crafts, Thursdays during July. Kids aged 6-12 will have a fairy tale program July 31-August 4th. 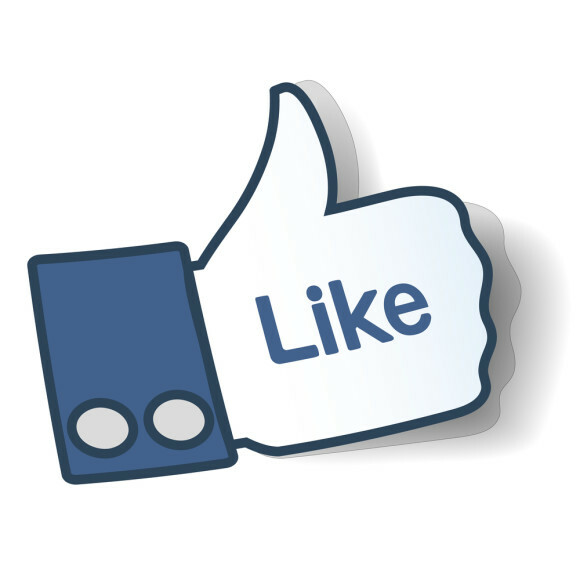 Preteens – this isn’t just for kids! Kids aged 8-12 will have Maker Days and see new technology, from August 14 – 18. For more information call the library at (845) 439-5440. Livingston Manor Free Library is offering a 6 hour Defensive Driving Class. Reduce as many as (4) points on your driving record, or save 10% on your car insurance. Sunday, August 13 11am – 5pm. Call (845) 439-5440 to register, which is required. Any questions regarding the class, feel free to contact William Daly at (845) 709-2160. Livingston Manor Free Library is hosting a Game Night on Friday, August 11 at 6:00pm. Games will be provided free of charge. All ages welcome! If you liked the decorative airplants we sold at Flower Day, we are having a Terrarium Making Class at the Livingston Manor Free Library! Wednesday, July 19th at 4:30pm – 6:00pm. Friday, July 14th from 6pm to 7:30pm is Lego Night at the Livingston Manor Free Library. Legos will be provided free of charge. Call (845) 439-5440 for more information. Livingston Manor Free Library will be closed Tuesday July 4th in observance of Independence Day. The 2018 Budget Vote for Livingston Manor Free Library is Tuesday, June 27th from 12:00pm – 8:00pm, at the library. This year’s Trout Parade will be here before you know it, so feel free to offer a service at this year’s auction! If you can think of a gift to make, a treat to bake, or a lesson to teach, just fill out the form (a full image can be viewed and printed by clicking the image), or come in and fill one out in the library. Friday, June 9th is Lego Night at the Livingston Manor Free Library. Legos will be provided free of charge. Just bring your imagination and hands to build. Livingston Manor Free Library will be close Saturday, June 10th because of Trout Parade festivities and events. Stop by our services auction inside of CAS, look for us in the parade, and just enjoy the day! The Livingston Manor Free Library will be closed Monday, May 29th in observance of Memorial Day. Thank you to all who served. LMFL has recently added a Community Resources guide, along with a link to county wide services made available through the Sullivan County Legislative Office. To access, hover over “Resources” in the menu bar below our header, and click on “Community Resources”! Our online resources (online catalog, e-reader information, etc.) is also now available under “Resources” in the menu. Flower Day and Flying Trillium! Please join the LMFL for an introduction to Native Plants by Carolyn Summers. Saturday, May 20th from 1pm – 2pm at the Laundry King. Walk-ins welcome, but call (845) 439-5440 for reservations and more information. Friday May 12th from 6pm – 7:30pm is Lego Night at the Livingston Manor Free Library! Legos will be provided free of charge. Just bring your imagination and hands to build! Call (845) 439-5440 for more information. Thank you all for supporting the library by buying raffle tickets for the quilts! Help The LMFL by Visiting the Arnold House! All through March and April, any money spent in the Arnold House’s pool table and juke box will be donated to the Livingston Manor Free Library. Have fun and donate to a good cause! Saturday, April 15th from 1pm – 3pm at the Livingston Manor Free Library, there will be an opening reception of Fly Fishing In The Catskills. Join us for a guest fly tyer and to view the display. Refreshments and snacks will be available. Friday April 14th is Lego Night at the Livingston Manor Free Library! Legos will be provided free of charge. Just bring your imagination and hands to build. LMFL is hosting a series of events in relation to the Iditarod! 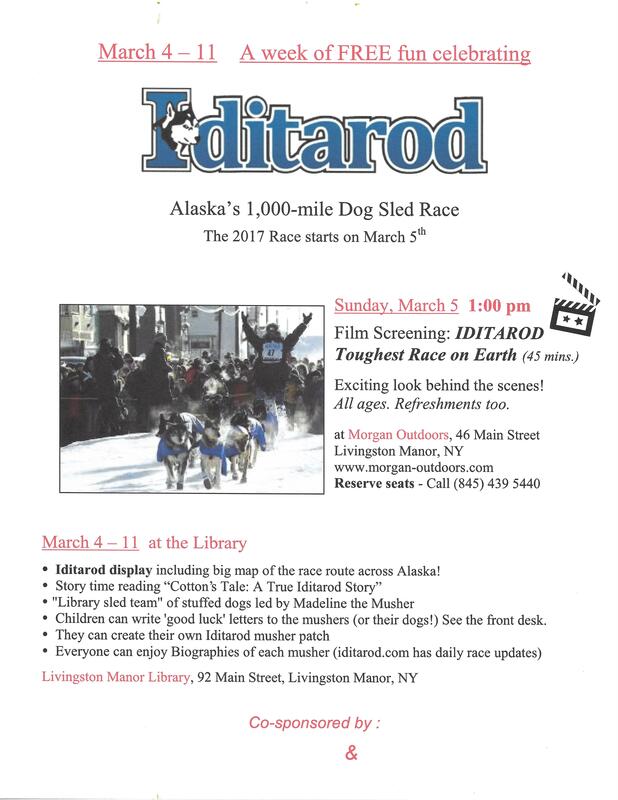 A documentary will be screened, there will be an Iditarod race map, and other updates and information to come. Click the image for a larger resolution, or call (845) 439-5440 for more information. Lego Night at the Livingston Manor Free Library is Friday March 10th. Legos will be provided free of charge, just bring your imagination and hands to build. Board games will also be available for play. Throughout this February, enjoy a date night on us. A bag of popcorn to take home with any movie you take out! Limit of one bag per person. Throughout February, enjoy a “blind date” from our collection of masked books. Each book will have a small description on the outside. If it sounds like a fit, give it a try! Livingston Manor Free Library will be closed Monday February 20th in observance of Presidents’ Day. Livingston Manor Free Library will open at 1pm due to snowy conditions. Stay safe out there! All board meeting minutes can now be viewed online! Just hover over the ‘about’ tab in the menu on our website, and click on “Board Meeting Minutes”. Friday, February 10th is Lego Night and Game Night at the Livingston Manor Free Library! Legos, board games and/or puzzles will be provided free of charge. Livingston Manor Free Library is closed today – February 9th – due to weather. Hit the slopes! Or better yet, curl up with a book! Livingston Manor Free Library will open at 1pm today due to icy conditions. Storytime will be cancelled, but we hope to see you all next week! The LMFL will close at 1.00 PM today due to inclement weather. Stay home and cuddle up with a good book or DVD – still an hour to come down and check something out! DRUMROLL!…OOPS! !…I MEAN DRUMSTICK! !…..BIG, BIG THANK YOU TO OUR 5K TURKEY TROT SPONSORS! A Big Gobble, Gobble to our local WILD TURKEY SPONSORS! DAVE FORSHAY & AMY HINES – Our Willowemoc Library Friends & ALL AROUND TERRIFIC PEOPLE! And a feast is never complete without GRANDMA’S STUFFING AND GRAVY! ALL YOU RUNNERS, TROTTERS, AND WALKERS! WE’VE GOT A BIG BACKYARD, LET’S USE IT! Friday, January 13th is Lego Night at the Livingston Manor Free Library! Legos will be provided free of charge. Just bring your imagination and hands to build! Livingston Manor Free Library will be closed December 31st for the holiday. Everyone have a happy and healthy, and we will see you in the new year! Friday December 9th is Lego Night at the Livingston Manor Free Library. Legos will be provided free of charge. Bring your imagination and hands to build! The library will be closed Thursday November 24th for Thanksgiving. We will be open this coming Friday and Saturday. Due to Veterans Day, Lego Night will be on the third Friday of November – going forward it will continue to be on the second Friday. Bring your creativity and hands to build! Call (845) 439-5440 for more information. The library will be closed November 11, 2016 in observance of Veterans Day. The last day to register is Friday October 14th. Registrations MUST be postmarked by that day to register. Election Day is Tuesday November 8th. Registrations forms are available within the library. Just ask at the circulation desk. 5K Turkey Trot THIS SUNDAY, NOV 6th – ENTRY FORM PDF HERE! Registration at 10.00 AM – 10.45 AM at MAIN STREET FARM – 36 MAIN STREET – LIVINGSTON MANOR, NY – RACE BEGINS PROMPTLY AT 11.00 AM – DRESS LIKE A TURKEY! Please join us for a 5K Turkey Trot in Livingston Manor, NY on November 6th 2016 to benefit the Livingston Manor Free Library! RACE ROUTE: 5k-turkey-trot-race-route-2016 Our race route provides runners with an opportunity to see many of our town’s beautiful, unique features that make Livingston Manor so special. The race takes participants past our beautiful school, through our historic 1860 Livingston Manor Covered Bridge, and past the Willowemoc Creek, known for its best-in-class trout fishing. Race day also coincides with the New York City marathon and is a perfect opportunity to get out of the city! Whether running or walking, the turkey trot is a great way for families to get out there and get moving! We’re a small town with a big backyard full of natural beauty – let’s use it! Main Street Farm will offer a free small soup with a sandwich purchase to race participants! Learn more about Catskill Mountainkeeper and their mission! 5K Turkey Trot – Race Route includes 1860 Historic Covered Bridge, Willowemoc Creek and more! More discounts around town on race day! Livingston Manor kids and parents/caregivers stay tuned for details on a Halloween pizza party co-sponsored by the Livingston Manor Free Library Livingston Manor Free Library and Catskill Pizza Garden! Catskill Pizza Garden has generously offered their support to the library and the community for this event. Expect free books, pizza, games, fun – AND wear your costume! Saturday, October 29th from 3.00 PM to 7.00 PM at the Catskill Pizza Garden (Main St. – Livingston Manor). Friday October 14th from 6pm – 7:30 is Lego Night at the Livingston Manor Free Library. The library will be closed Monday October 10th in observance of Columbus Day. A gem of a lighthouse by Gary Cormier from Erica Hart’s Senior Sampler Art Class this summer! Participants raved about these classes – we are inviting Erica back next year for another round! Thanks, Erica for a great, great program! Come see the exhibit through September – make an offer if you see something you like! Sunday, September 4th from 11:00am to 2:00pm is the annual Livingston Manor Library Labor Day Festival! There will be a book sale, mini chalk walk, painting, games, kids’ crafts, prizes and more! Appearance by local author Helena Pittman and a handful of literary characters! Come and see you can find. This year, taking place the library, 92 Main Street, Livingston Manor, NY. Friday September 9th from 6pm – 7:30pm is Lego Night at the Livingston Manor Free Library! Legos are provided free of charge. Call (845) 439-5440 for more information. Interested in 3D Printing? Have questions about how to use 3D Printing, or just not sure what it is? Come to the Livingston Manor Free Library on Saturday, August 20th from 1pm – 3pm for a hands-on workshop to have these questions answered. Due to limited space, pre-registration is required. Call (845) 439-5440 to register, or for more information. Update: If at all possible, please bring a laptop. We do have a few you could borrow, but that is also limited. Thank you. Senior Sampler with Erica Hart! Come to the library to learn how you can earn a personal pan pizza from Pizza Hut by READING! Ask your library director for details! Friday, July 8th is Lego Night at the Livingston Manor Free Library. Legos will be provided free of charge. The library will be closed Monday, July 4th to celebrate Independence Day. Get ready for the Trout Parade AND the Library Services Auction. The Auction starts online NOW! All proceeds from the auction will go towards supporting the library including purchasing books, DVDs, magazines, newspapers, computers, wifi, programming and more! Please come visit the LIVE auction at CAS in the East Gallery on the day of the parade Saturday, June 11th from 11.00 AM – 3.00 PM. Every Tuesday from 11:15-11:45 is Storytime for children ages 2-5 years old. Songs to sing, stories to hear and other fun and games for young children. Siblings, babysitters, and family are welcome. Friday the 10th of June is Lego Night. Grow! Build! From 6pm – 7:30pm. The first Saturday of the month is Farming Fun for kids in grades K-2. This month’s story is The Beeman by Laurie Krebs. 11am – 12:30pm, at the Livingston Manor Free Library. Free of charge and craft materials will be provided. For more information or to sign up, call (845) 439-5440. Have an interest in local news or journalism? Every Tuesday at 3pm, Manor Ink meets at the library to discuss, prepare and assemble the local town newspaper. Currently, they are looking for high school students to assist in its preparation. Call (845) 439-5440 for more information, or pick a copy up around town! On April 13th at 6:30pm, as part of National Library Week, we will host Get Your Garden in Gear. Speaker Dennis Hewston will be here to present tips for anyone with a green thumb or anyone new and interested in gardening. Bring your questions but leave your gloves at home. Event is free of charge. Call (845) 439-5440 for more information. Friday April 8th is Lego Night, from 6:00pm – 7:30pm! Bring your hands to build and imagination. Legos will be provided free of charge. The first Saturday of every month is Farming Fun, for students in grade levels K-2. The theme this month is Seed Sun Soil. Saturday at 11:00am-12:30pm. Call (845) 439-5440 for more information or to register. A workshop to create a unique three-dimensional sculpture made from an old recycled book will be hosted by the Livingston Manor Free Library on Saturday March 12th, from 10:30am to 12:30pm. All materials will be provided. A $5.00 registration fee is required. Call (845) 439-5440 to register. Friday March 11th is Lego Night, from 6pm-7:30pm. Bring your hands to build and imagination to create. Free of charge and Legos will be provided. Currently, the February 27th date is full, but we still have appointments open on March 9th, 2016 from at 10am, 11am, and 12pm. Need assistance filing taxes? We are here to help! An AARP Tax-Aide program representative will be here to assist you with your tax questions. Call (845) 439-5440 for an appointment. Did you know February is Childrens’ Dental Health Month? The library will celebrate Dental Health Month with a special preschool story time on Tuesday, February 16. Thanks to Public Health and the SC Rural Health Network for making this happen. Lego Night is returning February 12 at 6pm! Legos will be provided and free of charge. All you need to bring is your creativity and hands to build. Saturday, January 23, from 10:30-12, an adult craft class will be held. Please bring mementos to include in an 8″ x 8″ collage frame. A $10 registration fee will be required, and must be submitted at registration. Call (845) 439-5440 to sign up! Did you get a new device for the holidays? Do you have questions with how it works? We are here to help! On January 7th from 1pm-3pm we will be hosting How Does It Work to answer your questions by walk-in. If you cannot make it, please call (845) 439-5440 to set up an appointment that will be better suited for you. Friday January 8th at 6pm is Lego Night! Bring your creativity and imagination, and Star Wars themes are encouraged (but not necessary). 6:00-7:30pm at the Livingston Manor Free Library. Free of charge and Legos will be provided. This Saturday, January 2nd, we will be showing Annie (2014). Annie is a young, happy foster kid who’s also tough enough to make her way on the streets of New York in 2014. Originally left by her parents as a baby with the promise that they’d be back for her someday, it’s been a hard knock life ever since with her mean foster mom Miss Hannigan. But everything’s about to change when the hard-nosed tycoon and New York mayoral candidate Will Stacks makes a thinly-veiled campaign move and takes her in. Rated PG. All are welcome. 10:30am-12:30pm. Snack will be provided. We have a new tab on the top menu, Reading Recommendations, which has lists of books, just in time for the holidays! Find books by genre, author or title and similar titles. Winter Celebration 2015 is coming to a library near you on Friday December 18! This year the Livingston Manor Library is pleased to partner with Bethel Woods’ Education and Outreach Department to bring you Seasonal Song Making with Teaching Artist, Ramona Jan, for some musical fun. This Friday is Lego Night, 6:00-7:30pm. Bring your creativity and imagination and hands to build! Call (845) 439-5440 for more information. Free of charge and Legos will be provided. Now is the time for healthcare insurance enrollment for many New York residents (November 1 through January 31). Do you need help navigating the online application? Assistance will be available at the Livingston Manor Library on two dates: Thursday, December 10 and Thursday, January 14. Free, private, 90-minute appointments are available to help you select a health insurance plan through the official New York State Health Plan Marketplace for personal insurance, family coverage, Medicaid, Child Health Plus or a small business policy (50 or fewer employees). Call Nicole Tapia, Certified Navigator, at (845)857-3771 to make an appointment. The highlights from the 2015 Livingston Manor Labor Day Festival are now available on the web site! Just click the link on the right-hand column. It is in PDF format. Lego Night will be Friday November 13th! 6pm-7:30pm. No charge, and Legos will be provided. There will be an overdose training held at the Livingston Manor Ambulance Corps, 98 Main Street., Livingston Manor, NY on Tuesday November 10, 2015 at 7pm – 8pm. Hosted by Legislator Kitty Vettor, Livingston Manor Volunteer Ambulance Corps, and Livingston Manor Free Library. Call to register and for more information (845) 794-8080. Saturday, November 21 from 11:00 to noon, children in grades K to 3 are welcome to the Livingston Manor Library to join in a celebration of the life of award-winning author Vera B. Williams, local picture book creator. We’ll be reading A Chair for my Mother and making imaginative chairs! There is no cost to attend and refreshments will be provided. To register, call (845)439-5440 or stop by the library at 92 Main Street, Livingston Manor. Call to register for the second program in the Farming A-Z series! (845) 439-5440. Did you miss the survey while it was in the library? Now you can take it online! By completing the survey you qualify for gift certificates from these generous local sponsors: Babich Auto Service, Willow and Brown and Will Hardware. Click Here to take the survey. The drawing will now be held on November 1, 2015. Lego Night it returning to Livingston Manor Free Library! While we cannot offer a prize, we can offer you title within a category, which will be placed with a photo in Manor Ink. Please call (845) 439-5440 to sign up. Kids of all ages welcome. Looking for a job? Free individual job consultations with career coach Gregg Knowles are available on Thursday, November 12 in the morning at the Livingston Manor Library. Each interactive session will be geared to the needs of the individual with the goal of giving each participant the tools for finding a job in today’s market. Discussions can include practical ideas about job searching, creating better resumes and techniques for successful interviews. Registration is required. To schedule a session, call the library at 439-5440. The Livingston Manor Library is located at 92 Main Street, across from the firehouse. The Ramapo Catskill Library System (RCLS) “Help For You – Job Consultations” have been partially funded by the Ramapo Catskill Library System Coordinated Outreach Grant from the NYS Education Department, Division of Library Development. Last year, we had the Books in Bloom program during the school year, and it will be returning this year as Farming Fun. 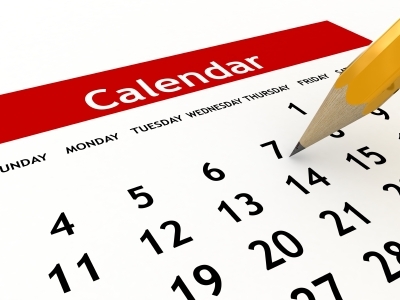 First Saturdays of the month during the winter, starting October 3rd. Kids in Grade K to 2nd are welcome to join! Please call the library at (845) 439-5440 to register your child. Friday December 18th at 6:30pm-8:00pm. Homegrown entertainment, homemade food, singing, children’s book sale, fun for the whole family. We’re making it easier for you to support your library with a financial contribution by using the new “donate” button on the right. Click the button to pay via credit card or PayPal. All contributions will be gratefully acknowledged via email or snail mail. Mondays between 3:00pm – 4:00pm, third and fourth graders are invited to come to Livingston Manor Free Library to discuss books. Academic and art enrichment, healthy snacks and more! Please call 439-5440 to register. Congratulations to the Labor Day Festival Quilt Raffle Winners! And a big thank you to Nancy Matrafailo and Liz Courtney for donating handmade quilts and Sarah Madison for donating an afghan. Friday September 18th at 6pm, Folklorist Ginny Scheer will present Folk Art. A local Catskills woman who creates, preserves, gardens and much more. Free and open to the public! This Friday night, August 28th at 6:00 pm, we are having Lego Night. A prize will be offered to the best creation! Judging starts at 7pm. Get ready for this year’s annual Labor Day Festival! Sunday, September 6th, starting at 11am. 5K race for adults and children, talent show, quilt raffle, vendors and more. Entertainment and fun for the whole family. For more information, please call the library at (845) 439-5440. This Friday, August 21st at 6pm, there will be a speaking discussing the Ukrainian Tradition of Beekeeping! Beekeeper and Folk Herbalist Halyna Shepko will share her love of bees and their uses in Ukrainian folk culture. Have a talent? Want to show it off? The Livingston Manor Labor Day Festival is the perfect place to do so, with a Talent Show. $100 grand prize! $10.00 to register. Call the library to sign up and arrange an audition. Proceeds will benefit the Livingston Manor Library. Movie Night at the Livingston Manor Free Library! Popcorn will be provided. Parents and children welcome. Movie will start at 6pm. Call (845) 439-5440 for details. We hope you will join us for this important forum. Speakers will help the audience to understand the depth of the heroin problem in the Livingston Manor area; however, the focus will be to help the non-medically trained to recognize the early warning signs and symptoms of addictive behavior. Saturday, August 15th there will be a bus trip from Livingston Manor Free Library and Roscoe Free Library to the Ross Park Zoo in Binghamton, New York! All children must be accompanied by an adult. $4.50 per person. Bus will leave promptly at 8:30 a.m. from Livingston Manor and 8:45 from Roscoe. Call (845) 439-5440 for more information or to sign up. Free access to Ancestry.com for NY state residents! Portions of Ancestry.com pertaining to New York are free to NY state residents. The New York State Archives partnered with Ancestry to digitize some NY state records of interest to genealogists. The resulting databases are free if you live in New York State. Once you enter your zip code, you’ll be asked to register for a free account. The Livingston Manor Library will be hosting Dr. Ellen McHale, Executive Director of the New York Folklore Society, and Benjamin Halpern, photographer, to speak about their cooperative project entitled Farm and Field: The Rural Folk Arts of the Catskill Region on Friday, July 24 at 6:30 p.m.
Halpern’s documentary-style photographs of contemporary agricultural life in Sullivan and Delaware Counties is currently on display at the library. The exhibit and accompanying programs are supported by a grant from the National Endowment for the Arts. McHale and Halpern will discuss the objectives of the project and answer any questions. The public is invited and light refreshments will be served. For more information call (845)439-5440. We will be having Family Nights at the Livingston Manor Free Library 6pm – 7:30pm Friday evenings during the summer. Enjoy board and card games, a Lego night, and a movie night! Parents and children of all ages welcome. For more information call (845) 439-5440. Thank you to all who supported the library in the recent referendum. The 2016 budget proposition passed, providing an annual increase of $9,124 to be used to upgrade and maintain our public-access computers, increase public program offerings, invest in the quality of the library collections and meet our basic operational costs. Spread the word: Now you can access FREE and interactive DMV permit practice tests here on the library’s website. Did you know that 72% of people fail their DMV driving test the first time? Practice sample permit tests as many times as you need – until you’re ready to take the real DMV test! No registration required. Click on the icon below or scroll down the column on the right. Will your grandchildren know your story? Every person has a story to tell. You don’t have to be famous (or an author) to write a memoir. It can be a wonderful legacy to leave to children, grandchildren or other family members. Louis Alexander, author of “Echoes From a Small Country Town” and retired high school principal, will show you how to write your own memoir. Free and open to the public. Please call to register, 439-5440. For those who are interested in the Spanish class, we regret to announce that it is full. You are welcome to call the library and leave your name and contact information so we can get in touch with you should the class be offered again in the future. As part of a collaborative initiative entitled Farm and Field: The Rural Folk Arts of the Catskill Region, a series of photos by local photographer Ben Halpern will be exhibited at the library during the months of June and July. These black and white photographs of contemporary farm life in Sullivan and Delaware Counties depict the cultural connection between modern farmers and their agrarian roots, shedding new light on the ever present agricultural heritage of the Catskills. The Open House on May 2nd was a success! Here are the winners of the drawings! Congratulations! John Beckett, Shirley Shwartz and Frances Ball. Prizes were generously donated by Photographer Gloria Wagenknecht and Livingston Manor store, Morgan Outdoors. Comfortable seating, public computers, many new books and Gloria Wagenknecht’s wildlife photography exhibit make this cozy corner a great place to relax. being offered at the Livingston Manor Free Library, as well as exhibits and library news. Battle of the Books Team Takes 1st Place! Are you between the ages of 8 and 14? Do you play chess? Would you like to learn how? The library chess club is now meeting on Wednesdays at 3:00 p.m. with our local chess pro! Call to register or just come by. Chess class is not meeting currently, but will return shortly. Congratulations to Vincent and Valerie on the new baby! Are you, or is someone you know, interested in studying for the NYS High School Equivalency test? A teacher is available at the library every Monday from 12:00 to 3:00 p.m. to help adults prepare for the test. All are welcome; there is no fee for participating. Home study materials are provided, so students who cannot attend can arrange to pick up work at their convenience. Call for information: 439-5440. Livingston Manor Free Library Goes Solar! Thirty 265W photovoltaic modules have been installed on the south-facing portion of the library roof. In total they will produce 8,000 kWh/year, or most of the electricity used in the library.